Once upon a time there was a great plan to remodel London after the fashion of the Eternal City. It all started a couple of hundred years ago when two blokes got together with a view to re-making the capital as a great imperial city that would rival the majesty and splendour of ancient Rome at her zenith. The first bloke was none other than perennial bad boy, Prince George, the Prince Regent who later became King George IV. Now as it happens Prince George was a young man in a hurry to make his mark. For much of his life he'd had a rubbish relationship with his father, George III, and had chaffed under the heavy burden of (usually disappointed) parental expectation that fell upon him as heir to the throne. Perhaps, as a result of all this negative feedback, he developed into a regular hedonist who was hell-bent on pleasing his senses (and yes, that would be all five of them) no matter what. One great upside of all this self-indulgence, however, was his patronage of the arts. George not only loved art, he was a real connoisseur: he recognised the good stuff as soon as he set eyes on it. And nowhere was his impeccable taste more evident than in the architecture that he sponsored. Which neatly leads me on to the second bloke: his partner in this great caper, John Nash, who was in my opinion the greatest architect of the age. Just think about the Royal Pavilion in Brighton or his wonderful terraces in Bath for a moment and I think you'll agree that he was a bit of a dude when it came to designing top notch buildings. Together these two blokes came up with a truly stonking vision of how London should look, and it's a real tragedy that George died before they'd got the job done. When George's younger brother, the tight-wad, William IV, succeeded him to the throne the wind blew in a very different direction and all major public works were either cancelled or progressed with a meanness of spirit and economy that blighted the great vision. Poor old Nash fell from favour, did very little new work for the rest of his life and then died in debt. 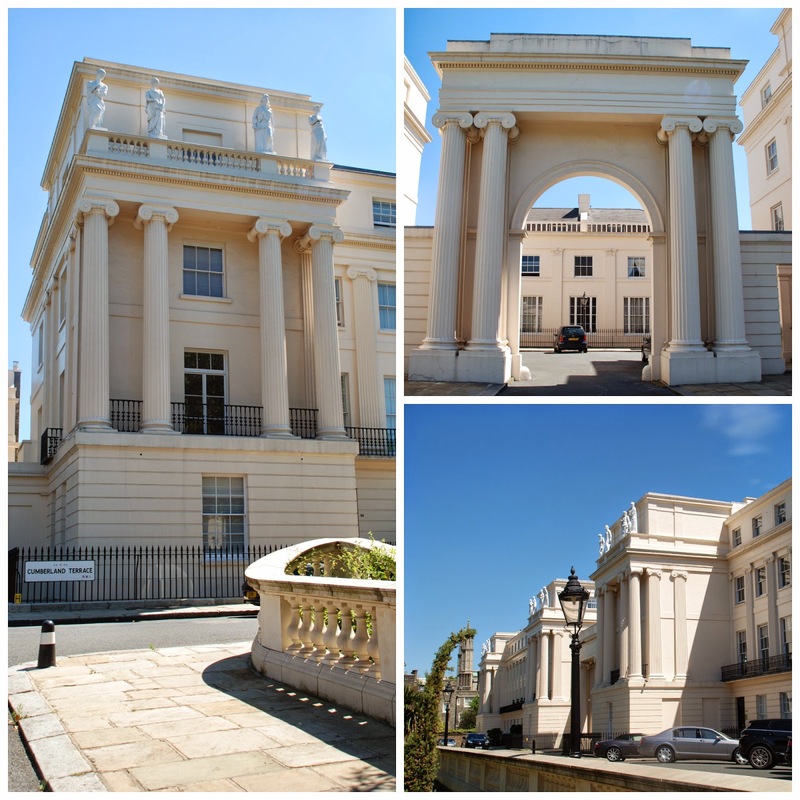 Anyway, back to the architecture: this is a walk that showcases some of what Nash and the Prince Regent/ King George IV achieved, and will hopefully leave an impression of how grand the city would have been if they'd gone the distance. 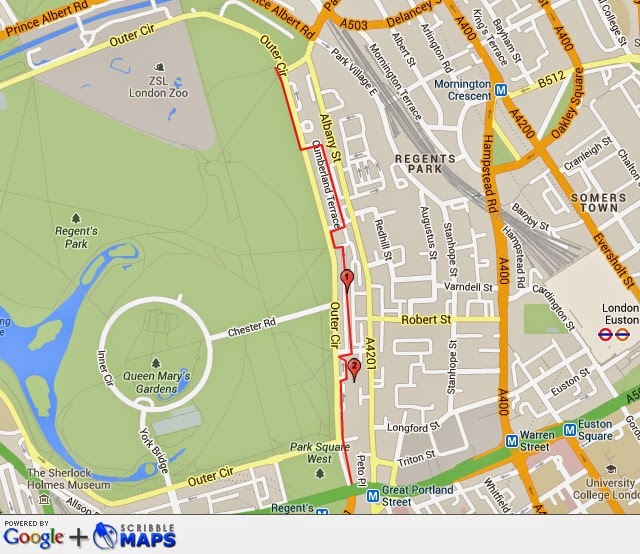 Here's an outline of where to go, starting from Regent's Park underground station. The whole walk is just under 7 miles long. 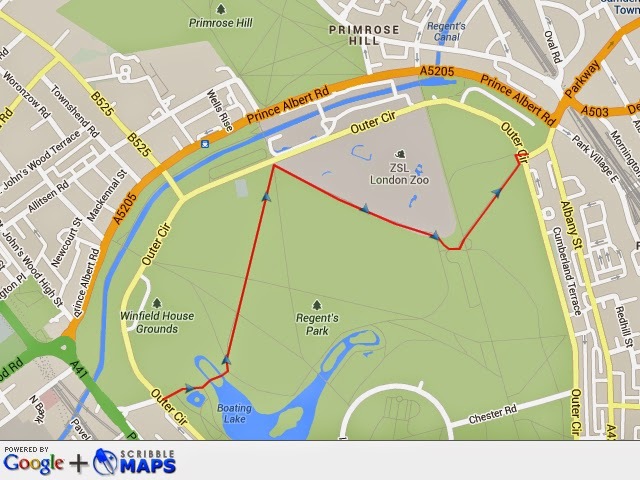 In this post I'm going to deal with the first half, which goes around Regent's Park starting from Park Square West, and ending in Park Square East. This stage is about 3 miles in total. 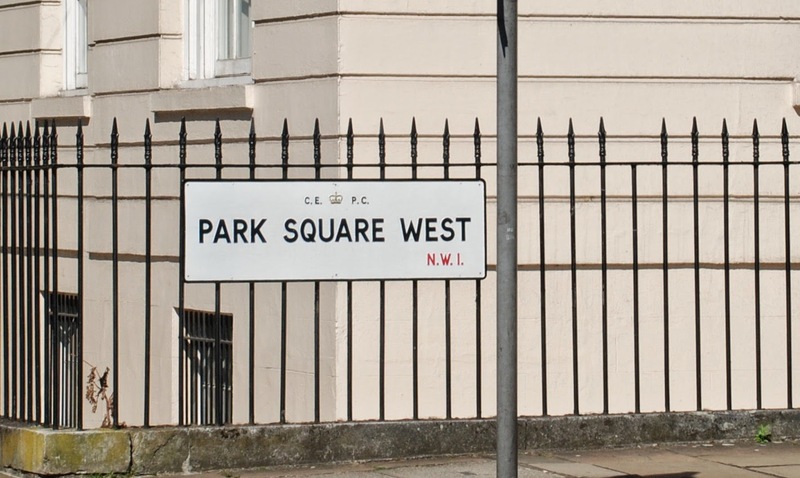 First cross the (very busy) Marylebone Road at the traffic lights and go straight into Park Square West. Maybe this would be a good place to insert one of my maps to show this part of the route in some greater detail. 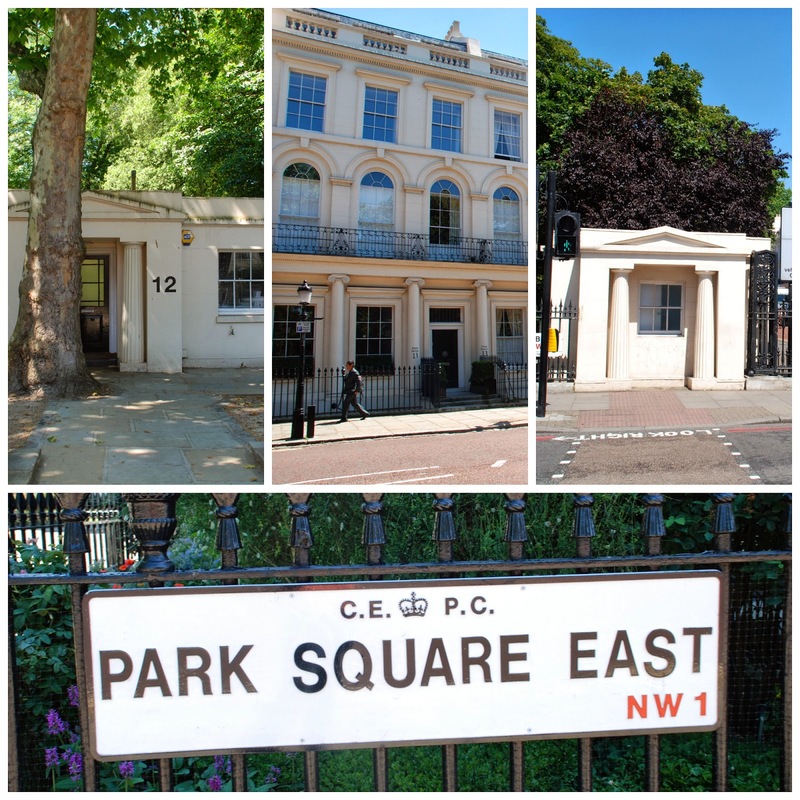 Park Square (built in 1823/ 1824) was designed by Nash as a sort of vestibule, a grand entrance that led from Portland Place into Regent's Park, punctuating the transition from a relatively built up area into the open greenery of the park. As with all of his terraces, each individual house is a component part in his grand overall design for the street. The result is a totally harmonic whole. Well, OK, totally harmonic minus the jarring note of the tarpaulin-covered scaffolding in the middle. Take the first left into Ulster Terrace. Ulster Terrace was also built in 1824 as part of the Park Square development. Turn right at the end of Ulster Terrace into Brunswick Place and walk along to the end of the street and turn left into York Terrace East. Walk along to the end of the street and turn right when you reach York Gate. Walk to the end of the street and turn left into the Outer Ring. 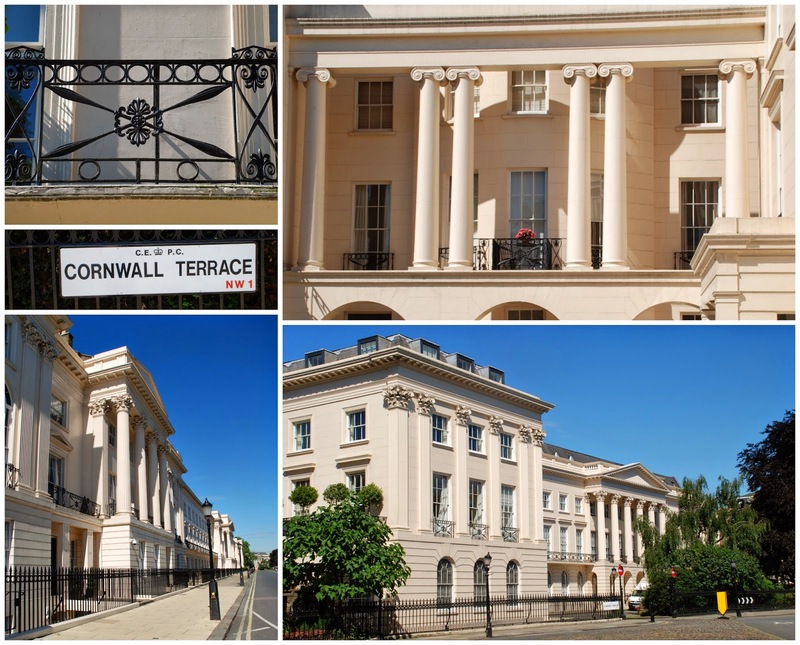 Keep on walking, and soon you will pass by the very lovely Cornwall Terrace, which overlooks Regent's Park. It looks amazing, shining in the sunlight from the distance, and, as you get closer, it just gets better and better. This was the first of the terraces to be completed. Construction took place from 1821 to 1823. Nash collaborated with another architect, Decimus Burton, on the design. Burton's father, James Burton, built the terrace under Nash's supervision. This partnering with other architects was typical of how Nash operated. 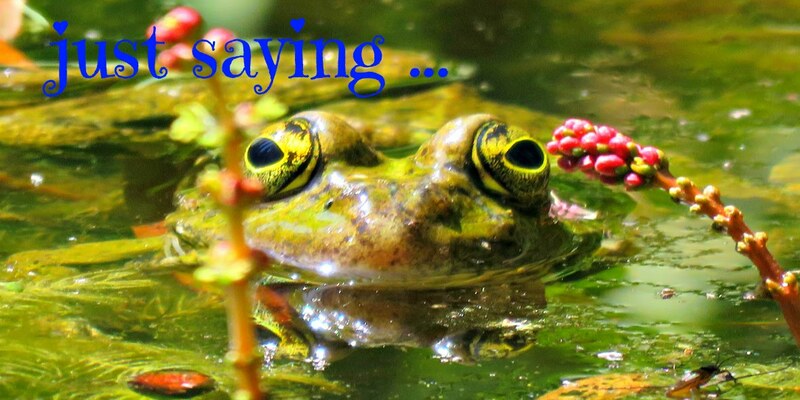 He was involved in such a staggering amount of work that he had little option other than to delegate chunks of the workload just to get it all done. Keep on going around the Outer Ring Road until you reach Clarence Terrace. It forms a little loop that reconnects again at the end with the Outer Road, and has the most glorious lawned garden in front. The scale of this terrace makes it all but impossible to get a shot of the whole facade. Perhaps if I'd had the foresight to come in my chopper ... . It is also the product of another Burton/ Nash design collaboration, and was named after William, the then Duke of Clarence, George III's third son, who later became William IV. He succeeded his brother George IV when he died without any legitimate issue. Frederick, the Duke of York (of The Grand Old Duke of York fame) George III's second son, who was the heir presumptive at the time of his death, had died without issue before George IV, leaving the way clear for the Duke of Clarence to succeed to their father's throne. 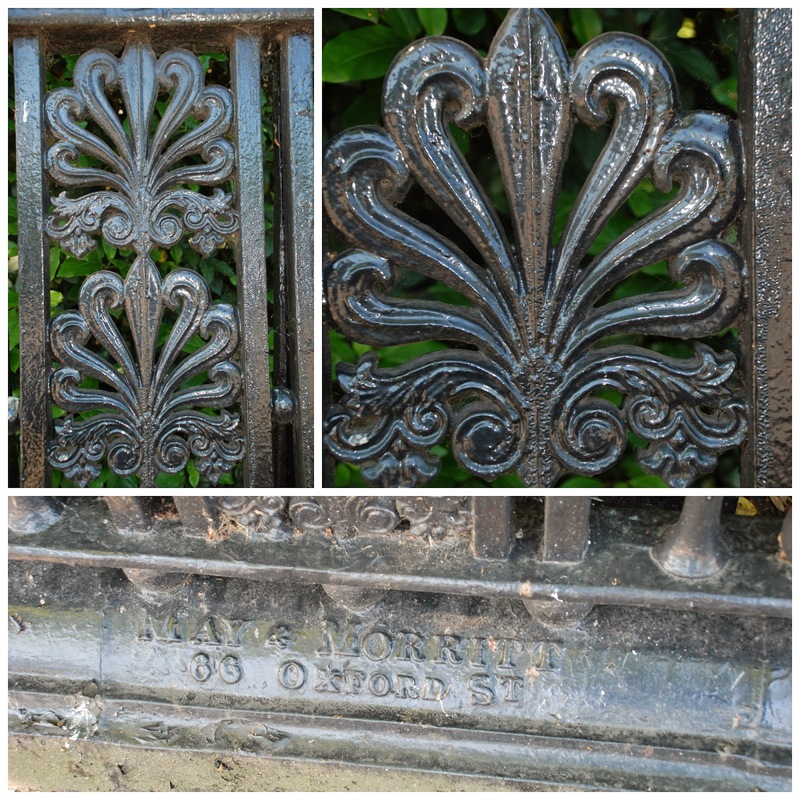 And one of the very many lovely things about this terrace is that it still has its original iron railings. They're a bit skew-whiff in sections, but they are rather wonderful nonetheless. So many of our London railings were carted away and melted down to make armaments during WWII only to be replaced with some very inferior looking hardware after the war had ended. I was delighted (yes, I am that sad) to find the maker's stamp: Messrs. May & Morritt, who appear to have operated from premises at 36 Oxford Street. Anyway, drag yourself on past the fabulous railings if you can and keep on trooping up the Outer Ring until you come to the glory that is Hanover Terrace. Now this one is a real beauty and a slew of famous folk have lived here over the years. H.G. 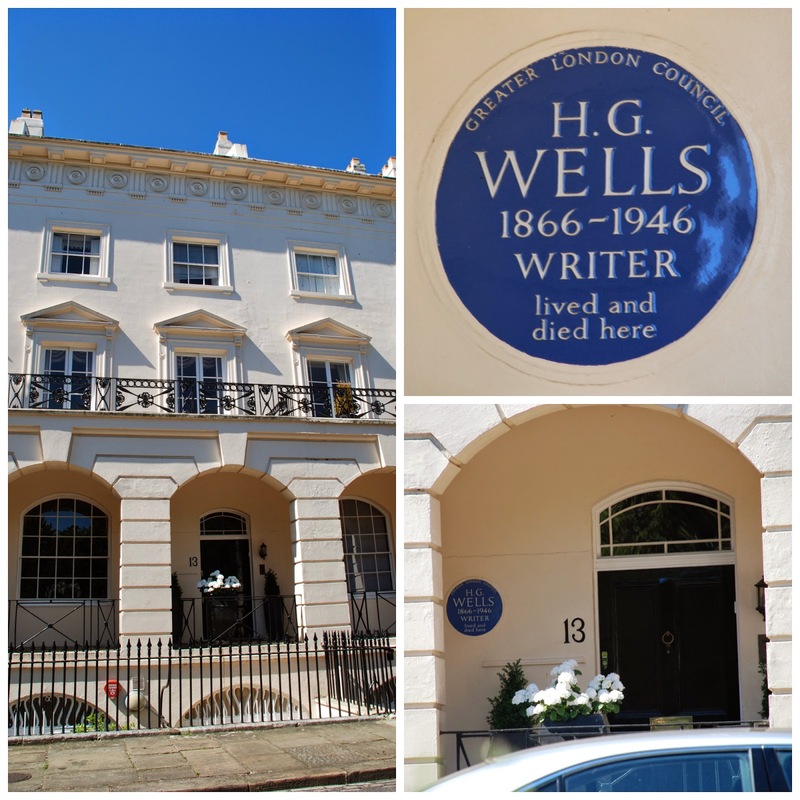 Wells lived and died at number 13. 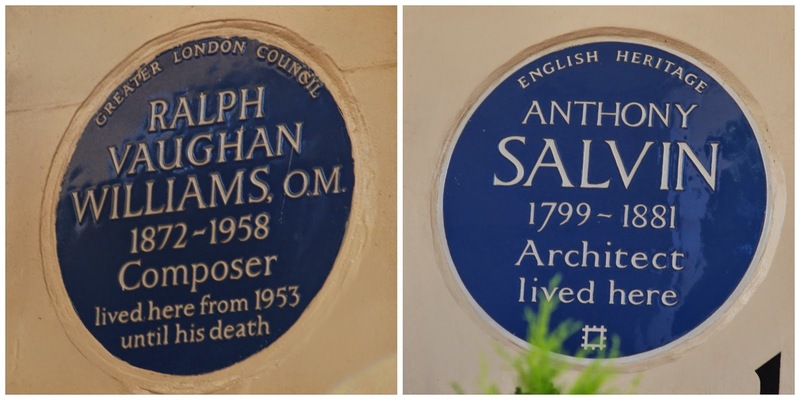 The composer Vaughan Williams hung out at number 10, and next door's number 11 used to be the home of Anthony Salvin, another well-known architect in the nineteenth century who specialised in the repair and restoration of medieval buildings. He did a bit of fixing and renovating at the Tower of London in his time. As with the other terraces the scale of this one makes it all but impossible to take a photo of the whole arrangement. 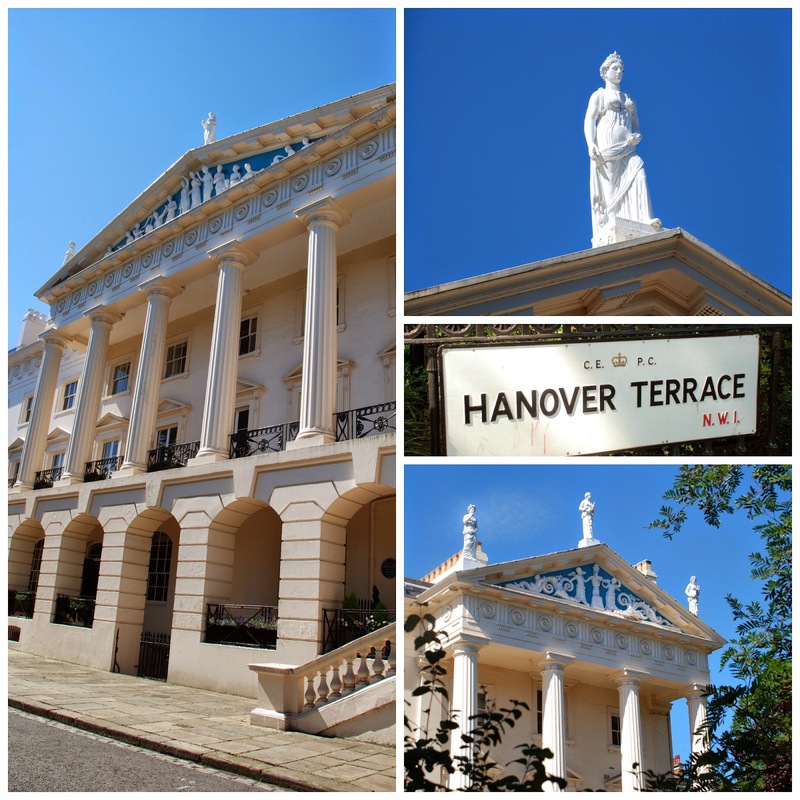 On exiting Hanover Terrace, cross the Outer Ring and enter Regent's Park via the Hanover Gate. Nash also had a part in designing the layout of the Park. 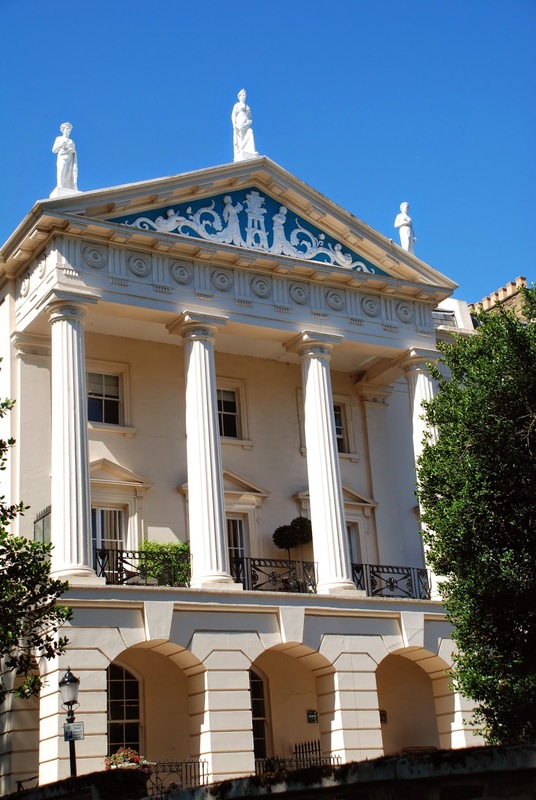 He was the architect who delivered the Regent's Canal, which feeds the boating lake, and was also used to bring provisions from the Thames to cater for the exclusive community who hung out in the fabulous villas around the Park. 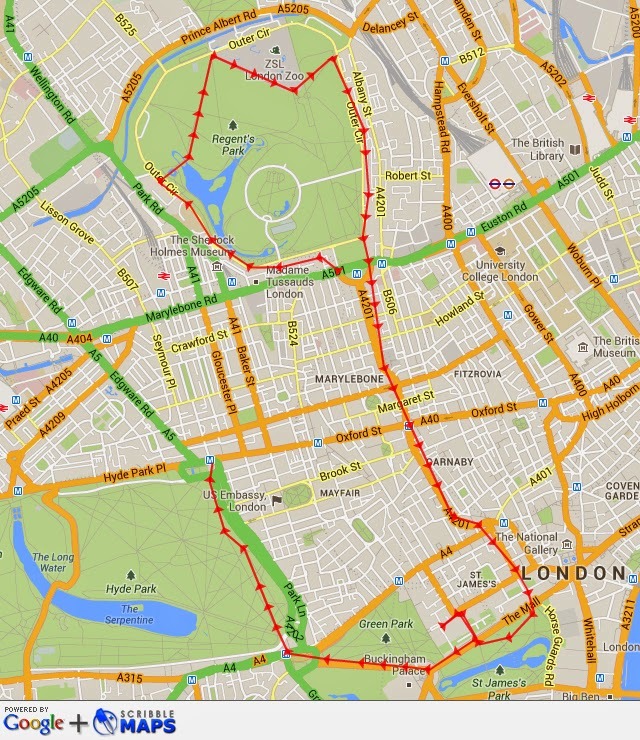 Now the idea is to walk across Regent's Park to the Gloucester Gate on the other side. It's largely up to you how you do it. When I'm there I like to take a detour up around the top of the park to look in on the camels in the zoo. Here's a map of how we did it. As you can see it's not exactly a direct route! If you follow my route you'll catch a glimpse of the Mosque at the Islamic Cultural Centre, which sits on the Outer Ring and, to my way of thinking, blends in rather pleasingly with the Nash terraces. You'll have the option of stopping off for a spin in one of the paddle boats. ... and the Telecom Tower, which looks like it's caught a bit of a tipsy lean. Must be something to do with my camera angle, although the ground looks straight enough ... .
One of the joys of Regent's Park in summertime is the traditional hay-meadow flowers. They're growing beautifully at the moment. 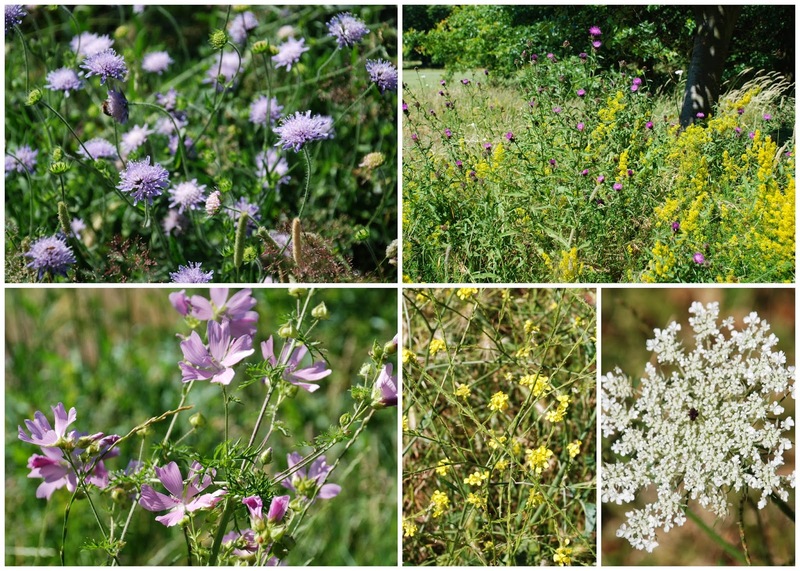 There are wonderful formal gardens as well, but I'm a big fan of the wild flowers. 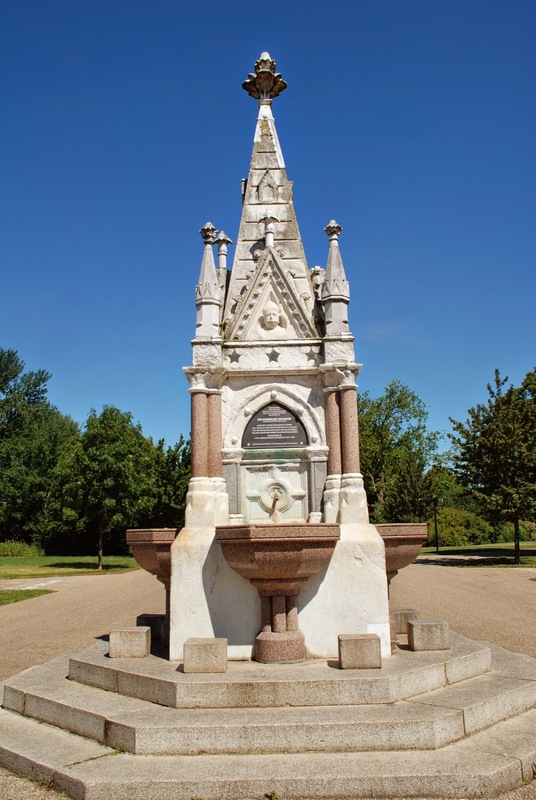 Also look out for this striking water fountain as you get towards the Gloucester Gate. 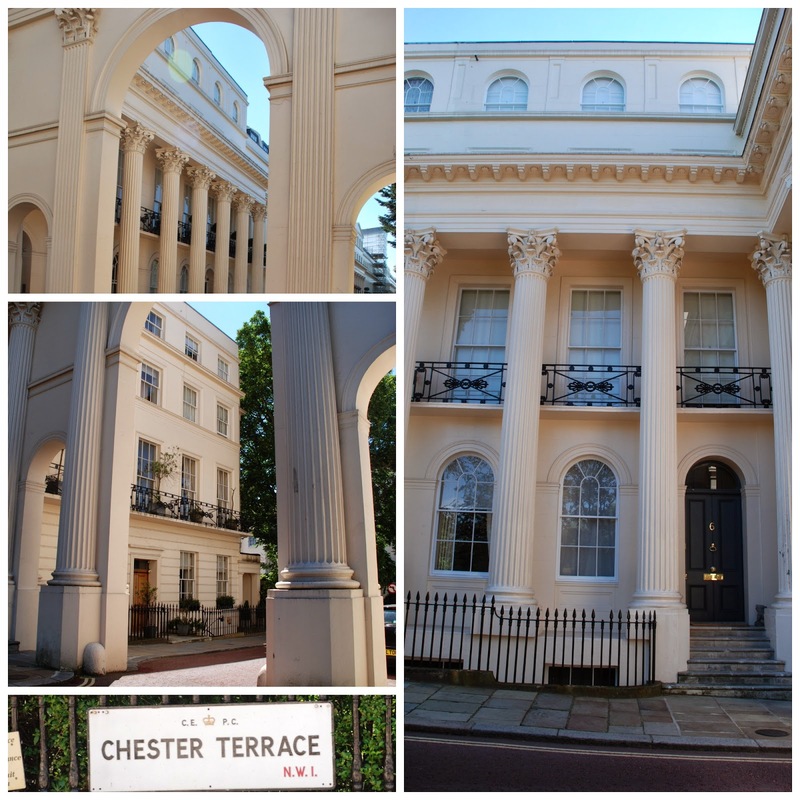 Now, having wet your whistle, keep on going in the direction of the Gloucester Gate, and as you approach you'll see the very elegant terrace of the same name. 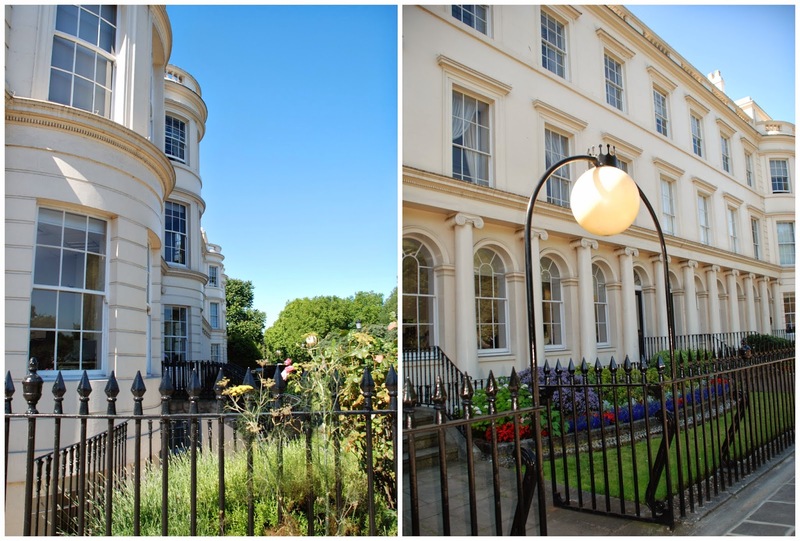 When you reach the gate, turn right into the Outer Ring, and keep on going past the Gloucester Gate terrace. I think I can feel another map coming on ... . 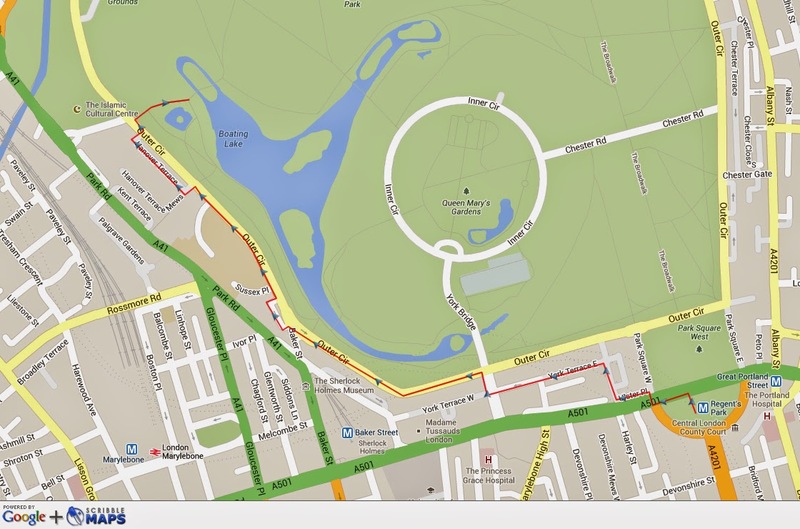 This is the route that we'll follow on the eastern side of the park. Soon you'll see the Danish Church of St. Katharine's on your left. Today this is a Lutheran Church serving the Danish community in London. However it was originally constructed to house the Royal Foundation of Saint Katharine's, an ancient religious house created and endowed by Queen Matilda in 1147. For 700 years the foundation, known widely as St. Katharine's-by-the-Tower, had worked in the East End to relieve the terrible poverty of the area, but in 1825, when they developed St. Katharine's Dock for commercial shipping, the old collegiate church and hospital of St. Katharine's were knocked down as part of the improvement. 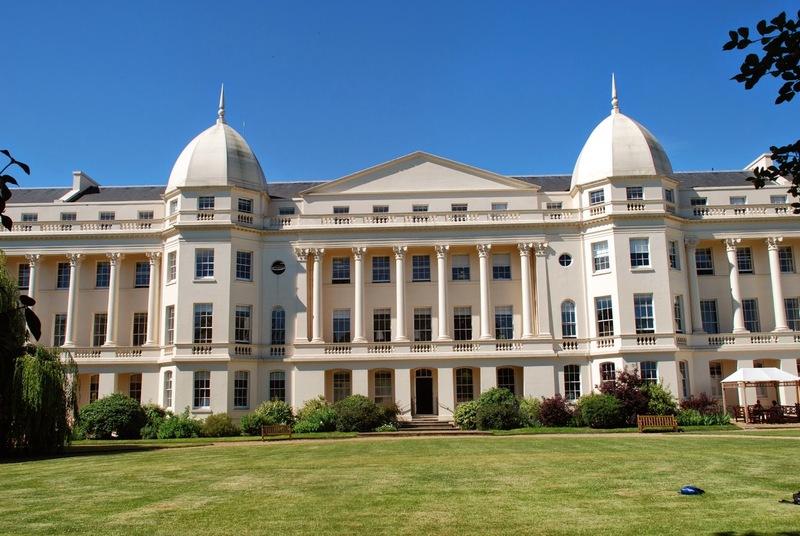 The richly endowed foundation was relocated to Regent's Park where they opened an almshouse that was largely populated by distressed gentlefolk of narrow means. St. Katharine's-by-the-Tower had been much loved by the folk of the East End. They had come out in numbers to defend it during the Gordon Riots, for example. And there was outrage that instead of ministering to the destitute poor of its old locale it was now tending to a group of people whose needs did not seem nearly so acute. After the Second World War it was decided that the foundation should return to its roots in the East End, and new premises were developed on the site of St. James Ratcliff's church, which had been bombed in the Blitz. This left the Regent's Park buildings empty so in 1952 the Danish Church moved in. Anyway I'm digressing as none of this has anything to do with our friend Nash. Keep on going along the Outer Ring, past the Danish Church until you see Cumberland Terrace on your left. Now this one is definitely worth taking a detour to have a look at. It's so huge that once again I was struggling to photograph it. 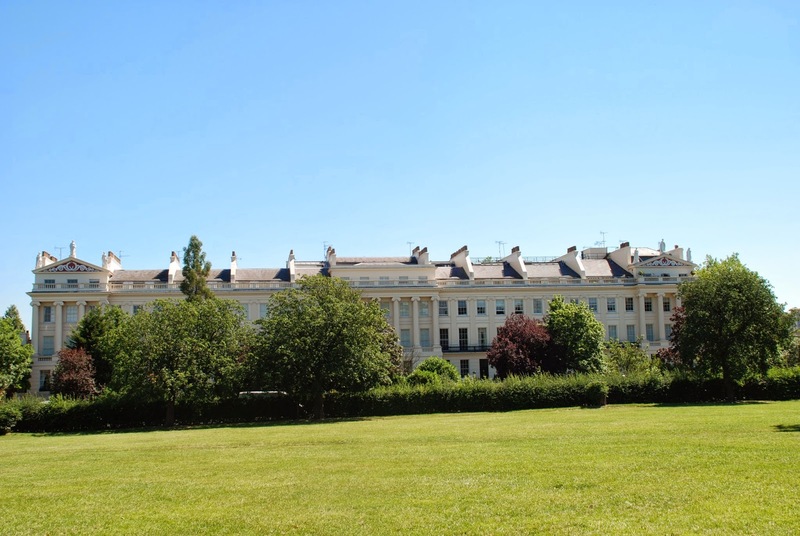 In the initial scheme for the park, the Prince Regent had intended to build a grand palace for himself, surrounded by the villas on these wonderful terraces, which would have been populated by his friends. 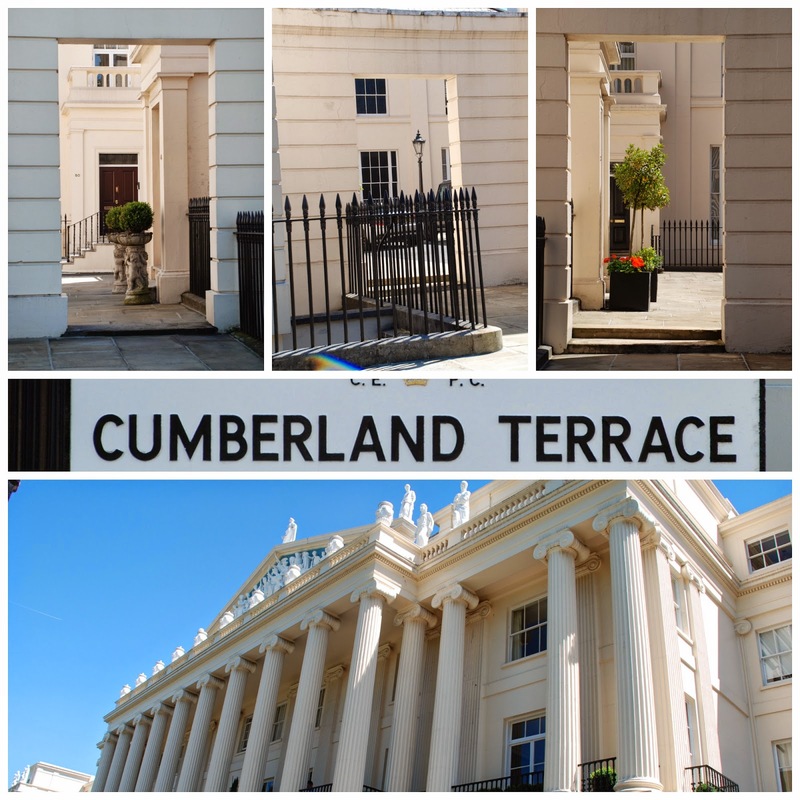 Cumberland Terrace was of special importance in the overall scheme as the Prince Regent's palace was to have been built facing it. As a result Nash made it even grander than the other very splendid terraces. 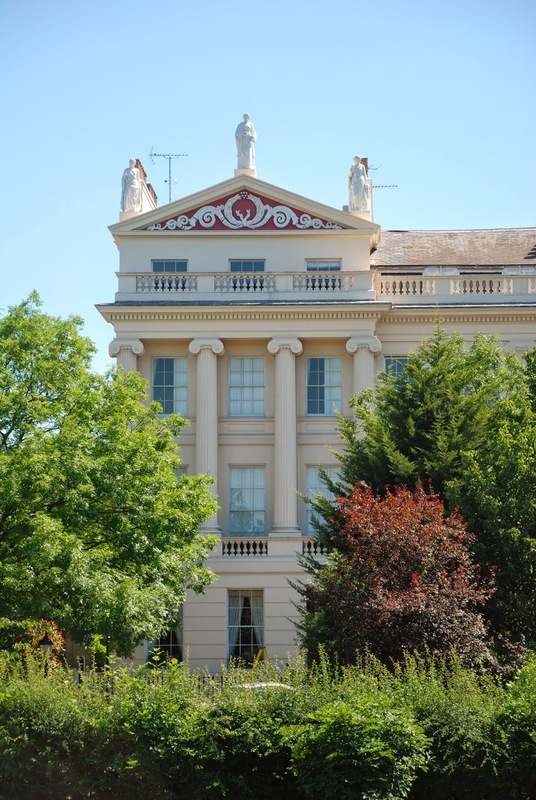 As things turned out the Prince Regent, by then King George IV, changed his mind about having a palace here, and instead had his chum Nash redevelop the old Buckingham House into Buckingham Palace, which we will come to in due course. Now carry on round the Outer Ring to marvel at the wonder that is Chester Terrace. It's a close run thing: I'm not sure whether I prefer Cumberland or Chester. But one of the two of them is ... probably ... my favourite Regent's Park terrace. One of the things I love about Chester Terrace is its entrance and exit arches. They are awesome, shouting out its name to all the world. 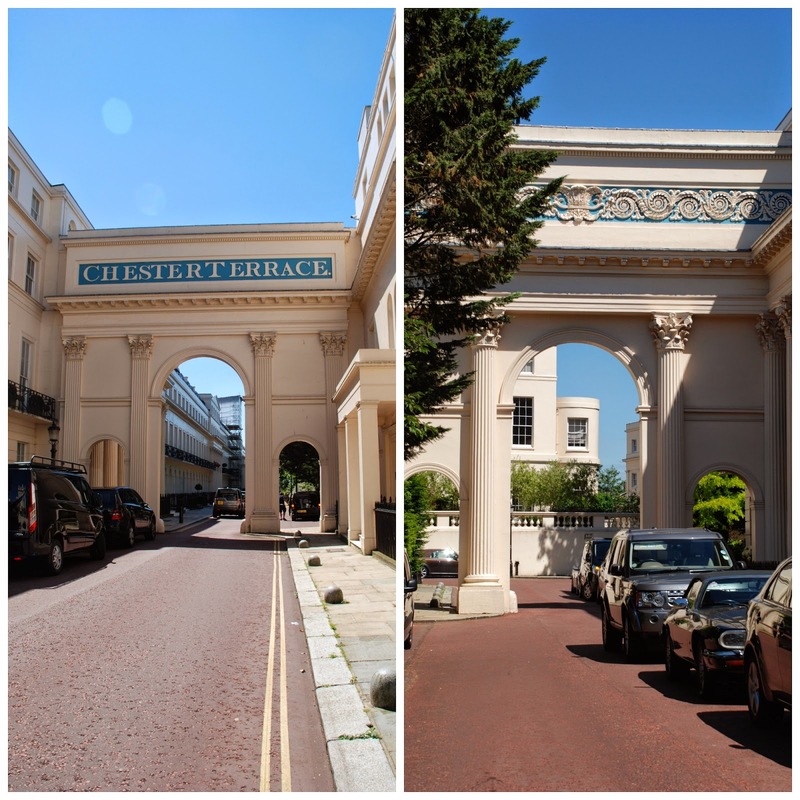 Chester Terrace was built in 1825, and holds the record for having the longest, unbroken facade of any of the terraces around Regent's Park (length about 280 metres). It was named after one of the titles (Earl of Chester) held by the then Duke of Clarence, George's younger brother, who later succeeded him as William IV in 1830. If you'd like to return to the Outer Ring you can skip next door to Cambridge Terrace, which is the next one on your left. It's not quite so grand, but by now we're getting a bit blasé after all the other magnificent stuff we've already seen. It's still rather elegant in its own right. Now keep on going on the Outer Ring until you enter Park Square East. In the centre are Park Square Gardens, one of the largest private gardens in London. The plane trees were planted there back in 1817 to celebrate the victory at the Battle of Waterloo in 1815. The nursemaid's tunnel, an early underpass, links the gardens with Park Crescent. 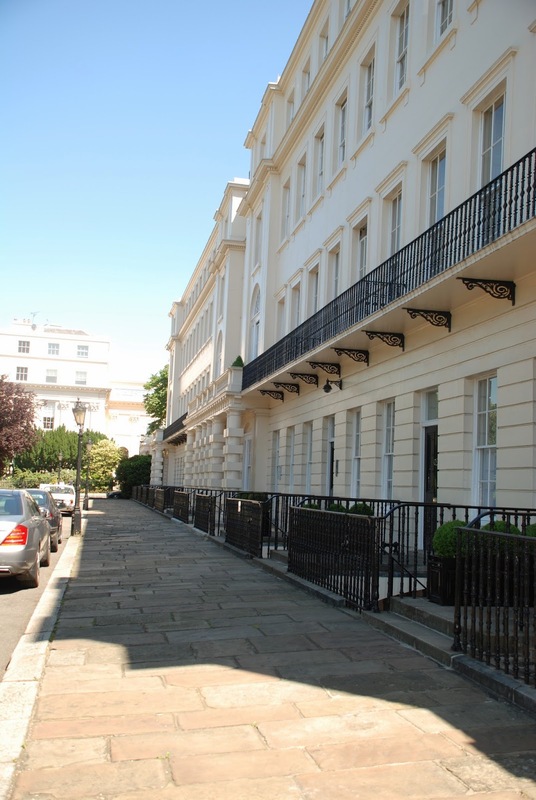 It was designed so that the folk who enjoyed access to the square might carry on their promenade in Park Crescent on the south side of the Marylebone Road without having to brave the terrible traffic passing overhead. If you plan your visit on Open Gardens Day you may be able to see it, but otherwise it's not available for use by the public. Watch out for the offices of the Prince's Trust on the left hand side of the square. And keep on going until you reach the Marylebone Road. 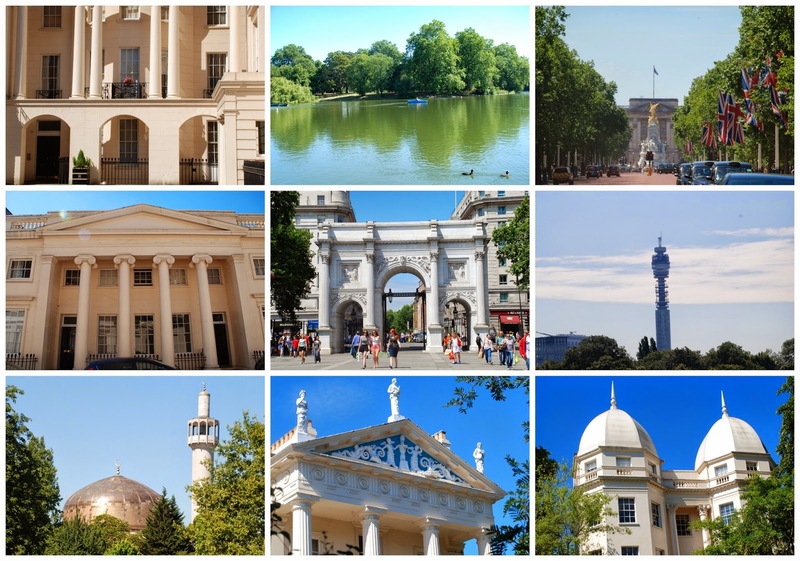 The second part of this walk picks up from this point, crosses the Marylebone Road and carries on via Portland Place and Regent Street to Buckingham Palace and Marble Arch. It's quite a long walk, so if you wanted to do it in two parts this would be a good place to break off, and restart from. 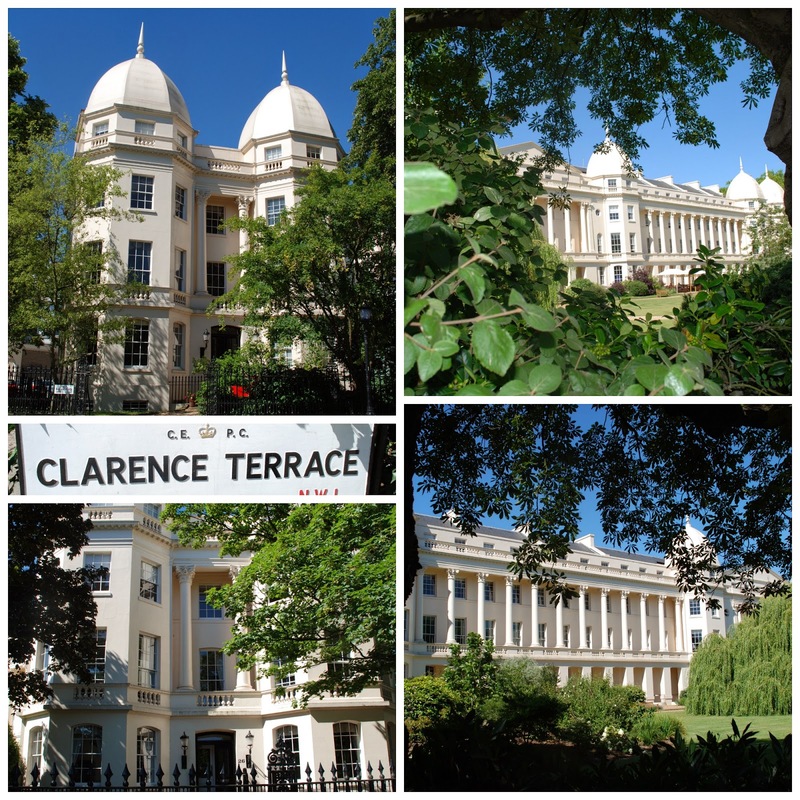 You can read about the second part of the walk here: Walking in the footsteps of John Nash ... Part II. Gorgeous shots of this amazing walk. The Nash terraces are just as you described as some of the best architecture in London. 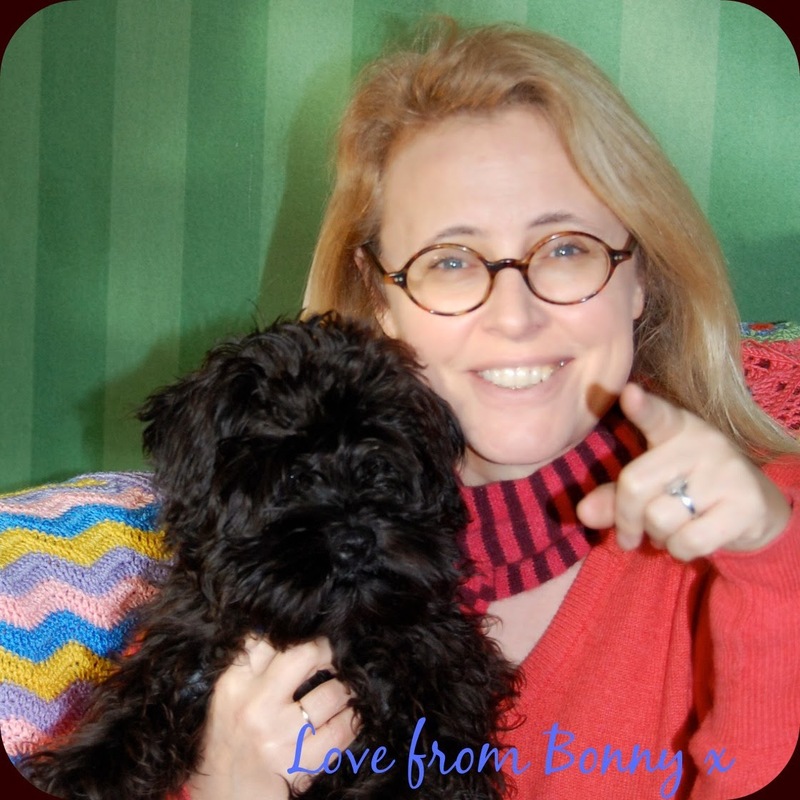 I enjoyed my walk - thank you! Beautiful photos. Makes me want to come back to London and walk some more.